The overall goal of this study was to determine the probable effects of marine fish cage culture on benthic communities using biotic indices, in Ghazale creek, Khowr-e Mussa region ( NW of the Persian Gulf). Monthly Sampling took place from June 2007 to March 2008 (during nine month). Stations were selected according to the distances from under cages to 400 m distance (as control site) in Ghazaleh Creek. Sediment samples were taken using Van Veen grab (0.025 m2 area) in 3 replicates; Percentage of grain size and total organic matter (TOM) were also analysed. TOM ranged from 6.11% to 23.26% and the silty-clay ranged from 4.76% to 97.47%. Macrobenthic community included 21 orders and the dominant groups were Polychaetes (60.62%), Molluscs (19.67%), and Crustaceans (16.49%), respectively. In this study, the all values of macrobenthic abundance, biomass and diversity factors in the station under cage were less than the control site. According to the ABC index results, the under cage, 50 m and 150 m distance stations have shown moderate pollution status, while the 400 m (control site) station showed unpolluted condition. According to the BOPA index, all stations were evaluated in poor ecological status. Fish production from marine aquaculture sites generates considerable amounts of effluent including nutrients, waste feed and feces, and by-products such as medications and pesticides. These effluents can have undesirable impacts on the local environment, depending on the amounts released, the time-scale over which the releases take place, and the assimilation capacity and flushing ability of the local recipient water body [1-5]. This may cause organic enrichment of the sediments beneath the cages thereby affecting the benthic community [1,6-11]. Marine biotic indices play an important role in regard to the ecological status assessment of aquatic ecosystems. Several biotic indices have been developed with the aim of standardizing the use of benthic communities in order to establish marine habitat quality. Some of these indices are based on the classification of species (or groups of species) in several ecological groups representing specific sensitivity levels to disturbance. One of the most useful graphical methods in ecological and pollution status description is ABC (Abundance Biomass Curve), as it can detect the health of benthic community . The other used index in this paper is BOPA that is the ratio of opportunistic polychaeta to amphipoda. The main advantages of this index, is the reduced taxonomic knowledge . This index is negatively correlated with amphipods, which are a particularly sensitive zoological group, not only to significant increases in organic matter but also to increases in other kinds of pollution including metals and hydrocarbons . On the other hand, polychaetes group contains both sensitive and tolerant species and they are found along the whole gradient from pristine to heavily disturbed areas . The presence or absence of specific polychaetes in marine sediments, therefore, provides an excellent indication of the condition or health of the benthic environment. Therefore the opportunistic polychaete/amphipod ratios serve as an indicator to estimate the effects of marine fish cages on sediment quality. Fish cage culture is one of the main fisheries activities, in Khowr-e Mussa creeks, that can affect the marine ecosystem. Marine fish cage culture was established in Ghazaleh creek for maintenance brood stock and reared juveniles since 1992. The site contains 9 cages with dimensions 2×2×3 m3 and 5×5×5 m3. That preserves 500 to 2000 fish yearly. They fed 5% of their body weight per day that can adversely affect sediment quality under and around the cages for longtime after 18 years activity. The purpose of this study is to determine the probable effects of marine fish cage culture on sediment quality by using bentic indices. Ghazaleh Creek is located in the north-west of Persian Gulf (48° 56 E and 30° 27 N) (Figure 1). Four stations from 1 to 4 were selected, based on distance from cages, including under cage, 50 m distance, 150 m distance and 400 m distance respectively. Monthly sampling was done from June 2007 to March 2008 (during 9 month) in 4 stations. At each station, 3 sediment samples for macrobenthic species composition and one sample for grain size and TOM analysis were collected using Van Veen grab (0.025 m2 area). For macrobenthos studying, samples were immediately sieved through a 0.5 mm mesh screen and benthic organisms were seperated from the samples by binocular microscope. Macrobenthos were identified to the lowest species level using benthic identification keys: and individuals of identified species were counted as number per m2 [16-20]. Macro fauna’s biomass is measured in milligrams of dry weight . The ABC method is an internal comparison of abundance and biomass distributions in any sample, based on the differential performance of those distributions in response to environmental conditions . ABC curve can be explained by the fact that in undisturbed communities, the presence of large organisms results in the biomass curve lying entirely above the abundance curve for at least the first three species plotted (Figure 2a); in moderately disturbed communities, these curves are closely coincident and crossed for the first three species (one or more times) (Figure 2b); in grossly disturbed communities, dominated by large numbers of small individuals, the abundance curve lies entirely above the biomass curve for at least the first three species plotted (Figure 2c) . BOPA index developed by Dauvin and Ruellet et al. for evaluation of the effects of pollution on marine ecosystem using macrobenthic communities . 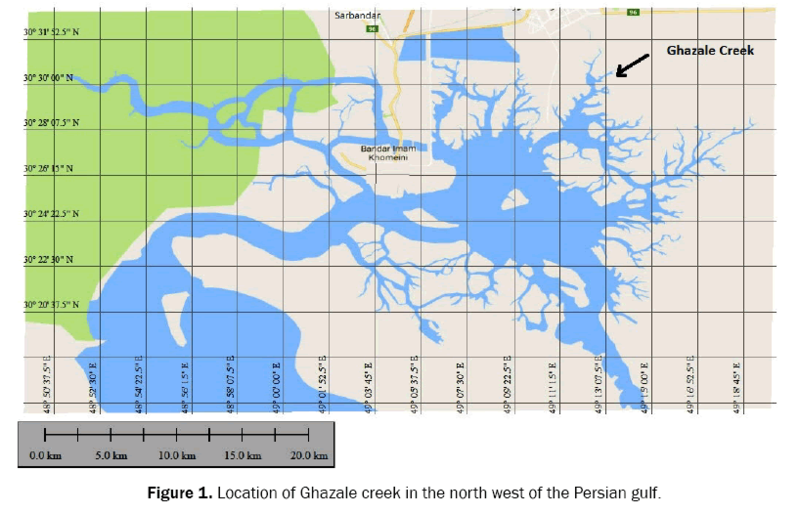 Figure 1: Location of Ghazale creek in the north west of the Persian gulf. Figure 2: ABC curves in undisturb, moderately disturb and grossly disturb . The range of BOPA index and H´ index in different ecological groups showed in Table 1. Table 1. Theorical variations of BOPA and H indices . The two analysis of variance (ANOVA) based on stations and months as fix factors were analyzed. The soft were such as Excel, Minitab version 15 and biological tools used to statistical tests. The results showed that mean percentage of silty-clay fraction and TOM ranged between 4.76-97.47 and 6.17-23.26 respectively. Significant differences in silty-clay values (p<0.05), and no-significant differences in TOM values, among the stations (p>0.05) were observed. 21 groups of macrobentic animals were identified. The percentages of most abundante macrobenthos groups and their biomass are shown in Figure 3. Among Polychaetes, Capitella sp. (15.9%) and Cirriformia sp. (12.6%), among Crustacea, Maera sp. (20%) and Tanaies sp. (19.6%), and among Mollusca, Ervilia scaliola (25.4%) were the dominant species. Figure 3: The faunal groups composition (%) of macrobenthos based on mean abundance and biomass in Ghazaleh creek. The maximum minimum mean of macrobenthos in both in both abundance and biomass were observed in 400 m distance station and under cage station respectively (Figure 4). Macrobenthos abundance has showed no-significant differences between stations. Figure 4: Comparison means values of macrobenthos abundance and biomass in sampled stations in Ghazaleh Creek in 9 month. Negative correlation was observed between total organic matter and Macrobenthos frequency (r =-0.25). The results of biotic indices values in sampled stations is represented in Table 2. Table 2. Biological indices values in Ghazale creek stations. According to ABC index, under cage station and 50 m station showed moderate disturbed, 150 m station showed grossly disturbed and 400 m station showed undisturbed conditions (Figure 5). 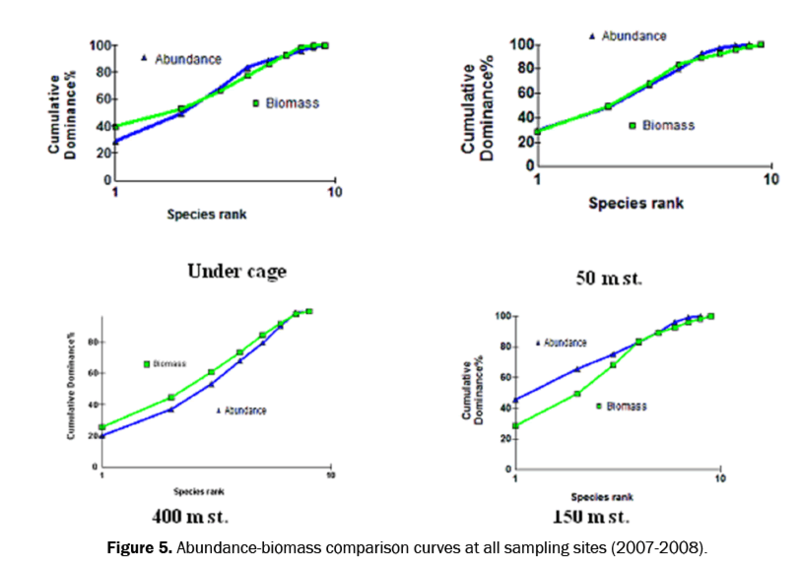 Figure 5: Abundance-biomass comparison curves at all sampling sites (2007-2008). The BOPA index values was calculated in ranged (0.25-0.34); according to the results maximum value was 0.34 in under cage station and the minimum value was 0.25 in 400 m station (Figure 6). 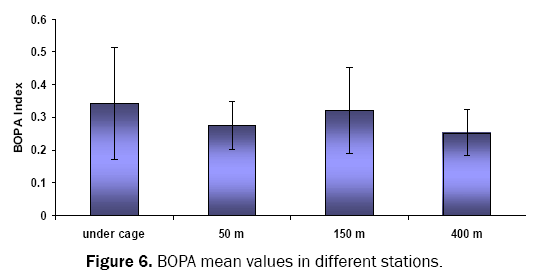 One-way ANOVA showed no-significant differences in BOPA values between different stations (p>0.05). Figure 6: BOPA mean values in different stations. According to grain size analysis and total organic matter content, it is clear that Ghazale Creek is characterized by soft muddy bottom. One of the important characters of muddy bottoms is sediment trapping. Fine particles in muddy bottoms have more organic matter and maintain more pollutants rather than silty-sandy bottoms. In this study the amount of TOM, in station under cage was more than that in the 400 m distance station and showed no significant differences between the studied stations, so this factor cannot be related to the role of marine fish cages on sediment. The dominant groups in the studied stations were Polychaeta, Mullusca and Crustacea, respectively. In the studies of Nabavi and Dehghan Madiseh the polychaetes were dominant group in Ghazaleh Creek, too [24,25]. The mean of macrobenthos abundance and biomass in under cage station was less than the 400 m distance station. Weston, reports the biomass of the macrobenthos community reduction is related to increased organic matter . Due to a similar bottom texture, current type and tidal current dominated in area no significant differences were observed between stations for TOM values; Dehghan Madiseh reported similar results, in her study in Ghazalel Creek . Also, there is a weak correlation between macrobenthos abundance and total organic matter which shows that, organic matter can have an effect on macrobenthos community. The maximum amount of Shannon-Winer H´ index was 2.66 in the 400 m station and the minimum, was 1.75 in the station under cage. According to Table 1, three stations showed moderate ecological status and the only station under cage with lower diversity has classified in heavily polluted status, this can be related to organic enrichment in this station. Beveridge, also reported a negative correlation between organic matter and macrobenthos diversity . ABC (Abundance and biomass comparison curve) has been porposed for quantifing the degree of community disturbance, the relative position of these 2 curves has been suggested to indicate severity of disturbance in three category as undisturbed, moderate disturbed and grossly disturbed area. According to ABC index in the studied under cage and 50 m distance station have shown moderate disturbance, 150 m station and 400 m station have showon grossly undisturbed conditions respectively. According to ABC curve in previous study Ghazaleh creek classified in moderate disturb area . The BOPA index is easier to use than other indices because the need for taxonomic knowledge is reduced. It is only necessary to recognize amphipods and a reduced list of opportunistic polychaetes and distinguish the Jassa amphipods from the others. According to the October 2005 inventory made available by the AZTI research (www.azti.es) team, the list of opportunistic polychaetes contains two families (Capitellidae and Cirratulidae),and nine genus (Cossura, Laeonereis, Ophryotrocha, Paraprionospio, Polycirrus, Polydora, Prionospio, Pseudopolydora and Rhaphidrilus) and 21 species (Chloeia rosea, C. venusta, Dipolydora caulleryi, D. coeca, D. flava, D. giardi, D.qua-drilobata, D.socialis, Ficopomatus enigmaticus, Glycera alba, Leitoscoloplos mammosus, Malacoceros fuliginosus, Neanthes caudata, N. irrorata, Parougiacaeca, Pholoeinor-nata, Phyllodoce (Anaitides) groenlandica, Schistomeringos rudolphii, Scolelepis tridentata, Sigambra parva and S.tentaculata). Although the maximum value of BOPA index was obtained in station under cage, there are no-significant differences between the studied stations based on index values. Also, the results indicated that according to Table 1 all of the stations were classified as ‘‘bad ” ecological status. According to diversity and ABC indices, the study area that was moderately disturbed but BOPA index showed grossly disturbed conditions. Since the all studies of Nabavi, Dehghan madiseh and Doustshenas reported that Ghazale Creek and Khowr-e Mussa classified as a moderate environmental pollution conditions, the results of the present study can be supports [24,25,28]. Each external factor in an ecosystem causes stress and brings change in an environment. Due to hydrodynamic nature and high tidal currents in the studied area (as natural stress), sever fluctuations in the benthic community are observed in unstable sediment. However, there is no single factor that causes fluctuations in the environment [29-33]. The abundance and biomass do not show increasing trend, and observed fluctuations, were may be caused due to semi-enclosed condition in Ghazale creek; but station under cage has special status such as high organic matter and low values in all abundance, diversity and biomass factors. The BOPA index results showed that cage culture activities can affect macrobenthos diversity; as a result of organic matter loading. Many factors such as anthropogenic activities in the studied area also could act as a main cause of the reduction of biodiversity [34-36]. The values of macrobenthic abundance, biomass and diversity in station under cage were less than the 400 m distant station. The result of ABC index shows that under cage, 50 m and 150 m stations have shown moderate pollution and the 400 m (control site) station showed unpolluted condition. According to the BOPA index, all stations have poor ecological status. These results showed that Ghazale Creek is a disturbed area and continuation of this stress can provide an unstable status that could have a sever effect on bottom community. The financial support through the South Iran Aquaculture Research Center in 2008 is gratefully acknowledged. Special thanks are due to the field crew and clerical staff of Ecology and Marine disease sections of South Iran Aquaculture Research Center. Gowen RJ, et al. The ecological impact of salmonid farming in coastal waters: a review. Oceanogr Marine Biology Annual Review. 1987;25:563-575. Ackefors H, et al. The release of nutrients and organic matter from aquaculture systems in Nordic countries. J Appl Ichthyol. 1994;10:225-241. Wu RSS, et al. The environmental impact of marine fish culture: Towards a sustainable future. Marine Poll Bull. 1995;31:159-166. AxlerR, et al. Water quality issues associated with aquaculture: a case study in mine pit lakes. Water Environ Res. 1996;68:995-1011. Kelly LA, et al. Waste loadings from a fresh-water Atlantic Salmon farm in Scotland. Water Res Bull. 1996;32:1017-1025. Findlay RH, et al. Environmental impact of salmon net-pen culture on marine benthic communities: a case study. Estuaries. 1995;18:145-179. Pergent G, et al. Preliminary data on the impact of fish farming facilities on Posidoniaoceanica meadows in the Mediterranean. Oceanologica Acta. 1999;22:95-107. Delgado C, et al. Livestock to 2020 The Next Food Revolution. Food, Agriculture and the Environment Discussion Paper 28, IFPRI USA. 1999:1-83. McGhie TK, et al. The degredation of fish cage waste in sediments during fallowing. Aquaculture. 2000;187:351-366. Naylor RL, et al. Effect of aquaculture on world fish supplies. Nature. 2000;405:1007-1024. Nordvarg L, et al. The effects of fish farm effluents on the water quality in the Aland archipelago, Baltic Sea. Aquac Eng. 2002;25:253-279. Warwick RM, et al. Analysis of macrobenthic and meiobenthic community structure in relation to pollution and disturbance in Hamilton Harbour, Bermuda. J Exp Mar Bio Ecol. 1990;138:119-142. Pinto R, et al. Review of estuarine biotic indices to assess benthic condition. Ecol Indic. 2009;9:1-25. Dauvine JC, et al. Polychaete/amphipod ratio revisited. Mar Pollut Bull. 2007;55:215-224. OlsgardF, et al. Polychaetes as surrogates for marine biodiversity: lower taxonomic resolution and indicator groups.Biodivers Conserv. 2003;12:1033-1049. Barnes RD, et al. Invertebrate Zoology (5th Edition). S Afr J Zool. 1987. Jones DA, et al. A field guide to the seashores of Kuwait and the Persian Gulf. University of Kuwait. 1986:1-192. Hutchings PA, et al. An illustrated guide to the estuarine Polychaete worms of new South Wales. Coast and Wetlands SocietySydney. 1984:1-160. Carpenter KE, et al. Crabs: FAO species identification guide for fishery purposes. The living marine resources of the Western Central Pacific. Volume 2. Cephalopods, Crustaceans, holothuridians and sharks. FAO Rome. 1998:1045-1155. SterrerW, et al. Marine Fauna and Flora of Bermuda. A Systematic Guide to the Identification of Marine Organisms. John Willy & Sons. 1986:1-742. Holme NA, et al. Methods for study of marine benthos, second edition. Oxford Blackwell Scientific Publication. 1984:1-387. Warwick RM, et al. Environmental impact studies on marine communities: pragmatically considerations.Aust J Ecol. 1993;18:63-80. Adams SM, et al. Biological Indicators of aquatic ecosystem stress. American Fisheries Society, Bethesda, Meryland. 2002:1-644. Nabavi SMB, et al. Studies on Mahshahr creeks macrobenthos with emphasis on their importance in fish feeding. PhD Thesis. Marine Biology Islamic Azad university, Science and Research,Tehran.1999:-203. DehghanMadisehS, et al. Identification of sensitive and under effect area in Mahshahr creeks by using ecologic and biologic index. PhD. Thesis Marine Biology, Khoramshahr Marine Science and Technology University, iran. 2008:1-144. Weston DP, et al. Quantitative examination of macrobenthic community changes along an organic enrichment gradient. Mar Ecol Prog Ser. 1990;61:253-269. Beveridge M, et al. Cage Aquaculture Second Edition. Fishing News Book Oxford. 1996:1-346. DostshenasB, et al. Classification of Khur-e-Mussa coastal waters by using sediment biotopeindex to evaluation of biotic health. PhD Thesis, University of Marine Science and Technology Khoramshahr, Iran. 2009:1-165. NilsazMKh, et al. Hydrological and hydrobiological study in Persian Gulf (Khuzestan coastalwaters). Iran Fisheries Research Organization. 2005:1-117. Borja A, et al. A marine biotic index to the establish ecology quality of soft-bottom benthos within European estuarine coastal environments.Marine Poll Bull. 2000;40:1100-1114. Bortone SA, et al. Estuarine indicators. CRC Press. 2005:1-530. Gray JS, et al. A possible method for the detection of pollution induced disturbance on marine benthic communities.Marine Poll Bull. 1979;10:142-146. NeiraC, et al. The role of Heteromastusfiliformis(Capitellidaepolychates) in organic carbon cycle. Opheli. 1994;39:55-73. Guerra-García JM, et al. Soft bottom mollusc assemblages and pollution in a harbour with two opposing entrances. Estuarine, Coastal and Shelf Science. 2004;60:273-283. Sarda R, et al. Life cycle, demography, and production of Maren Zelleriaviridis in a salt marsh of southern New England. J Mar Biol. 1995;75:725-738.